Round 3 of the Qualification Europe for the World Championship 2015 in Qatar was played in the scope of just a few hours with all ten matches being played on Thursday night. After three of six rounds have been played, Romania and Bosnia and Herzegovina remain the only two teams with an entirely clean record as they pocketed their third consecutive win. 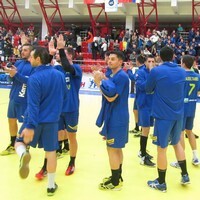 Romania had no problems whatsoever and took home a 36:19 victory against Cyprus in front of 1,000 spectators in Bukarest. They top Group 2 with the maximum of six points ahead of Slovakia that beat Italy 34:26. Bosnia and Herzegovina won the first of their two matches against Latvia 27:26 but gave away a big advantage as they were already leading 17:11 at half-time. Latvia can take revenge in only 72 hours when part two of the double-header is played on 5 January. Portugal won the second match in Group 5 25:17 against Estonia. Bosnia and Herzegovina occupy the first rank with six points ahead of Latvia with four, Portugal with two and Estonia with zero points. In Group 1 the match between Finland and Lithuania ended in 20-all draw, while Turkey gained their first points by beating Georgia 29:23. First-ranked Lithuania (5 points) can already make a major step towards qualifying for the next stage, the European play-offs, if they beat Finland in the re-match on 4 January. Only the five group winners qualify for the play-offs in which they will meet 12 of the 16 EHF EURO 2014 participants plus Germany to eventually decide nine European participants at the World Championship 2015. In Group 3 Switzerland kept their chances after a strong comeback in the second half against Ukraine. They were trailing 16:21 after thirty minutes, but led by David Grabner, who scored seven goals, they ended the game with a 34-all draw. Slovenia kept Luxembourg winless by beating them 36:16. Israel and Belgium were the happy teams in Group 4 on Thursday. The former beat Greece 31:24, while the latter won the neighbouring duel against Netherlands 28:22. Round 4 of the World Championship 2015 Qualification Europe will be played on 4 and 5 January. Rounds 5 and 6 from 8 to 12 January. All matches can be followed with the EHF live ticker.